Global demand for meat processing equipment market is expected to reach above USD 14,490.6 million in 2021 at a CAGR of above 7.4 % between 2016 and 2021. 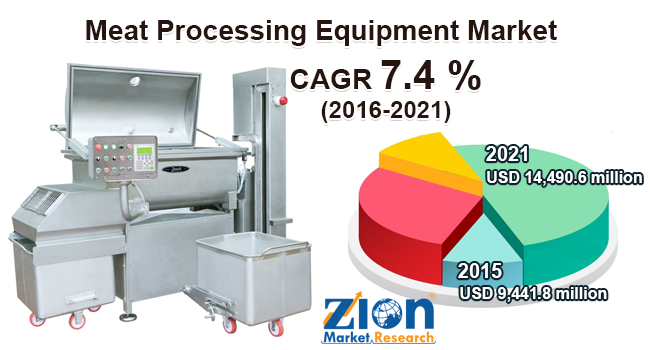 The meat processing equipment market report comprises forecast and analysis of market on a global and regional level. The study includes historic data of 2015 along with a forecast from 2016 to 2021 based on revenue (USD Million). The study provides drivers and restraints for the market along with the impact on the demand over the forecast period. Moreover, the report encompasses the study of opportunities that are currently present in the meat processing equipment market on a global level. In order to give the users with the complete view on the meat processing equipment market, detailed competitive scenario, strategic development and patent analysis and product portfolio of key vendors are added. The competitive landscape in the market is well explained with Porter’s five forces model for the meat processing equipment market. Strategic development along with patents analysis and product portfolio is incorporated in this report. The study covers a market attractiveness analysis, in which meat type, equipment type segments are constitute based on their market size, growth rate, and attractiveness. The study present a significant view on meat processing equipment market and can be segmented on basis of meat types such as duck meat, chicken meat, turkey meat and other types. Different types of equipment designed for the processing of meat are killing & defeathering, cut-up, evisceration, deboning & skinning, marinating & tumbling, freezing and others. All the segments have been well studied based on current and upcoming trends and the market is anticipated from 2015 to 2021. The regional segmentation comprise the present and future demand for North America, Europe, Asia-Pacific, Latin America and the Middle East and Africa which is further split into major countries including U.S. Germany, France, UK, China, Japan, India, and Brazil. The report emphasis on detailed competitive view along with company profiles of the key players operating in the global meat processing equipment market. Key participants profiled in the report include Prime Equipment Group, Inc., Duravant, BANSS, BAADER, Marel, Stephan Machinery GmbH, BIRO® Manufacturing Company, Lyco Manufacturing, Inc, Bettcher Industries, Inc, Mepaco, A-One Manufacturing LLC and Marlen International among others.